The silly picture he texted us all while he was in Maui, a couple of days before he died. One year ago today, I was having a stressful Thursday and decided in the middle of third period that I was going to take the following day off—for sanity. I remember thinking, I just need a day to rest or else I might get sick. So I made some last-minute substitute plans for the next day, requested a substitute teacher through the school website, and headed home right after 6th period. I had no idea that my father had died in the midst of my preparation. I went home to a lonely house. Owen was away at school taking a media course. Kanan had left to be with his dad for a few days. And so I lied down on the couch and held my 6-month pregnant belly and fell asleep. I slept hard. So hard in fact that I missed the calls from Linda. I missed the calls from my sister. I missed the calls from my mom. I missed the calls from Owen. I awoke at 6:30 only to realize I needed to race off to my bible study which met at 7. So I quickly grabbed my phone and my bible, slipped on my shoes and started to head out of my house. I looked down at my phone to see if I had missed any calls and saw the number down below. I missed 12 calls. I saw Owen was the last call I missed so I called him first. He answered upset and stressed—why hadn’t I been answering my phone because he had tried to call 6 times to tell me to call my family? Why were my sister and mother and everyone calling him? He was in class and needed to focus and everyone was blowing his phone up and no one was leaving messages. I hung up and scrolled through my missed calls. My mother was next. I called her. At this point I was in my car and hadn’t yet started the engine. She answered crying. I can’t recall exactly what she said because her words and tone sent me into a cyclone of fear and confusion. I can piece fragments of her words. “Oh no Theresa…..its terrible its terrible… I can’t tell you…I can’t tell you…. You are pregnant…I can’t tell you.” And then she let out deep sobs, so deep, so primal, I knew someone I loved was badly injured or dead. “Mommy please tell me….just tell me!” I cried. But she hung up. I scrolled back through my missed calls and stopped short when I noticed that the first missed call came from my dad’s phone. My father who was currently on a beautiful vacation in Maui with my stepmother, Linda. My parents, who would never call me while on vacation. I pressed the number and held my breath. “My dad is dead?” I asked, as if that idea had not been something I had considered up until this moment. I immediately screamed out long, dragged out “No’s.” I dropped the phone on my lap and just cried and cried, heaped over in the driver’s seat like a sack of flour, feeling like I was crumbling into little pieces of dust. I can’t imagine what Linda was doing or thinking on the other line as she heard my cries. And to think she had to make that phone call to my sister and brother, to my aunts and uncles, to my grandmother; each time having to sit there in her own despair and have to listen to ours as well. I don’t know how she did it. I don’t remember the rest of the conversation. At some point I must have ended it. I remember calling my sister and immediately headed over to her house. We were going through a tough time in our own relationship at this time in our lives and yet, how silly and meaningless it all seemed now. I went over without a thought. All of that was gone. I needed to be with my sister right now, the only family closest to me while Owen was at school. On my way to my sister’s house I called him. He didn’t answer. So I texted him: my dad is dead. That night and the following day are a blur. I’m so glad I already had a substitute planned. I don’t know how I would have even been able to plan a sub-plan during that time. The following night, Linda flew back. My brother and his wife and son as well as my sister and her kids, Owen and I, and our Aunts sat in Linda’s house, waiting for her to come home. She insisted on driving herself home from the airport. When she arrived, we all just held each other and cried and cried. We all spent the night. The entire weekend, we all crammed together in my father’s house with Linda and just mourned together. Monday was a holiday, so I assumed by Tuesday, I would be able to go back to work. I remember thinking it would be the best way to heal. I was wrong. By the end of first period I was in tears and wondering what I was thinking coming to work. I was so relieved when the Vice Principal walked confidently and yet delicately into my room and asked me why I was even here. I packed up and headed home. It took a couple of weeks before we could hold a funeral for my father. His body was stuck in the coroner’s office in Maui and then had to be shipped to Minnesota or something for another test before it could return here. I didn’t realize how much work and time went into autopsies. But during that time, I made a video and a scrapbook for my father, as well as wrote a memoir of him called “His Hands.” Pain has always been a creative catalyst for me. And creating, whether it be through my writing, painting, or other media has been the only way I can sort through reality and to deal. It purges me, heals me. So by the time the day of his funeral arrived, I was doing better than my sister and brother. Still, we all do things differently. I had planned to show the video and read to the funeral guests the memoir and so I felt I needed to be strong. If I broke down and cried, I don’t think I would have stopped. And they deserved to see the video. They deserved to hear the story. They came here to celebrate his life and to mourn his death. It was an open casket up until the funeral itself. I stood there in that room, setting up the video equipment with my father’s lifeless body laying in the casket behind me, yet I refused to look. That man was a shell. I didn’t want to remember his shell. I wanted to remember my father. Still, the image I caught in my peripheral vision of his soft, fuzzy brown hair, dusted with gray still resonates with me. Looking back, I regret the decision. It sounded right at the time. But somehow, I think now it would have been good to hold his hand one last time. To kiss his cheek one last time. I don’t remember the last time I had actually seen him before he left to Maui. Owen and I had taken him out to lunch one afternoon a few weeks before. And I had stopped by quickly to pick up some tools and I remember his pleased smile when he greeted me, his warm sweater-covered-arms around my shoulders. His large hand patting my belly. But I don’t remember which one happened in which order. And given that was still a couple of weeks before he passed away, I didn’t get to say good-bye. The last words I had with him were through a text. 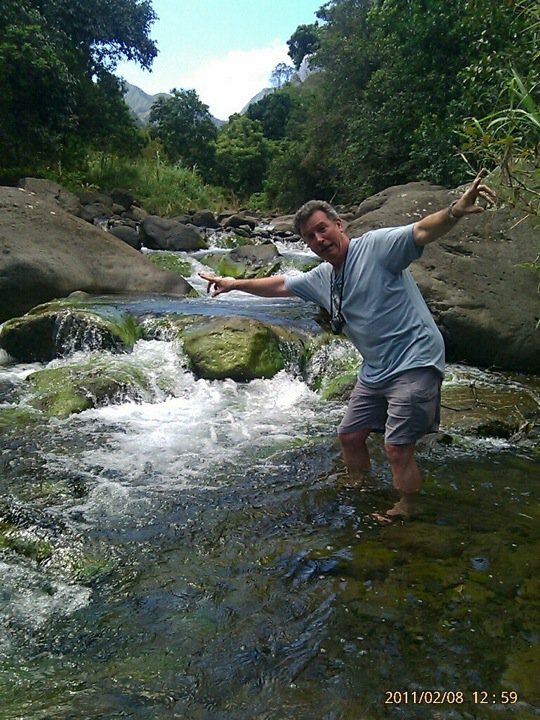 He was in Maui and texted me a silly picture of him by a stream pretending to be falling, the one posted into this blog. I texted him back: Looks like you are having a great time! He replied: Its kind of hard not to. And that was it. I didn’t reply back. Oh how I wish I had replied back. Said something like—Daddy, you have been everything and more that I could ask in a father. You are a great man and I am so honored to be your daughter. I will love you forever. Still, that doesn’t mean we don’t mourn. More so for ourselves than anything. We are incomplete without him here. Linda still mourns, probably more so than anyone else, and rightfully so. He was her soul mate. She is alone now with out him. She lives with my grandma now, my dad’s mother. And they have a great system set up. They are good for each other and I’m so glad my grandmother is there with her. She sits in his chair. She rubs her feet together the same way he does. And I see him in her. A topic came up the other night in our family after we watched the movie Courageous together. What is it like to continue living without your love there? Is it like living with an amputation? She said no. For her, she feels abandoned, she said. What do you say to that? No hug, no pat on the shoulder, no meaningless “keep your chin up” comment could remedy that. All I could say was, “I’m so sorry. Thank you for sharing that with me.” Even then….stupid. It was a stupid thing to say. I don’t know what the right thing would be. Probably nothing. Probably just a hug and a good cry. My brother,sister, and I have all had our own trials this year as we’ve mourned. And yet despite the trials, we have persevered. My brother has a new job and a growing second career in music. He has started to go to church again. The first time since he was a child. My sister has moved out of her boyfriend’s house and exploring a new independent life and a newfound relationship with Jesus as well. God uses all things for good. I myself have had Jameson. Owen and I decided his middle name would be Jeffrey, after my father. He is a beautiful, happy baby with an easy-going disposition, just like my father. He bears his name well. I wish my father could have met him. And now we are pregnant again. Amazing how much my father is missing. But then again and I can’t help but be reminded that no matter how many awesome life events he is missing, he is having a way better time with the Lord. We have joys, yes, but in a broken, fallen world, waiting to be restored by the creator when Christ returns. My father on the other hand, is with Him. He is with the Great I AM. No child, no wife, no father, no friend can ever be as awesome and fulfilling as that. And I also take great comfort in knowing that this life, with all its joys and pain, is but one grain of sand in an eternity of beaches we will spend together one day with the Lord. My children, by the grace of God, will meet their grandfather one day. But until that time when we see him again, I will keep his memory alive through these blogs, through his photo illustrations, through the stories of his life we share as a family. My children will meet him already knowing him. I promise you that. « Pregnant again….Baby #3 due tentatively, July 19th. Beautiful, T. Absolutely beautiful. Your father is very proud of this.